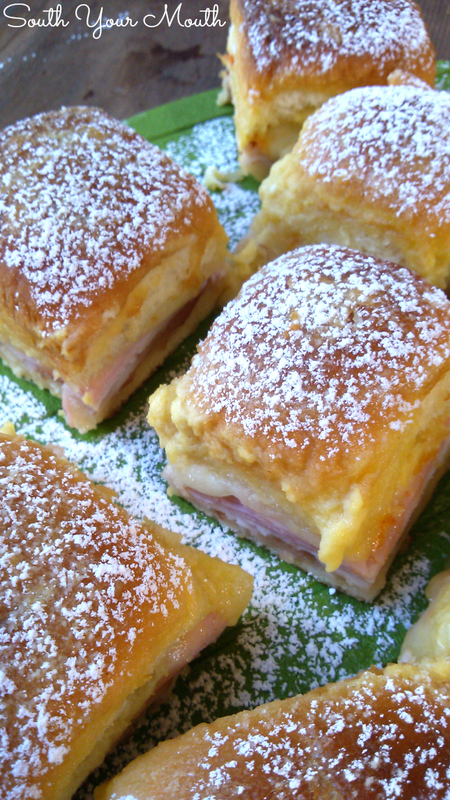 Party sandwiches made with ham, turkey and cheese baked in a rich buttery topping dusted with powdered sugar. You know those party rolls with ham and cheese that are baked with a buttery poppy seed topping? We always called them “Holiday Ham Rolls” or something like that. Well, I love them. Other than the fact I end up with poppy seeds all in my teeth and walk around for an hour before I realize I've been laughing like a donkey with my teeth chocked full of black seeds. 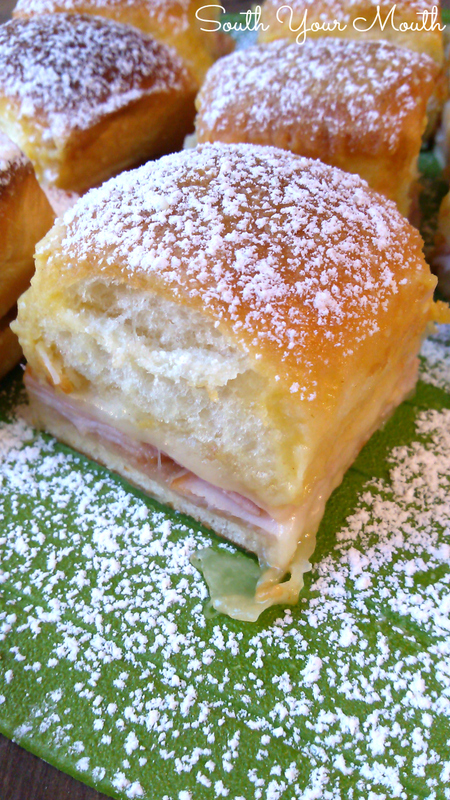 Anyway, I’d been trying to think of a new spin on these and decided to make a Monte Cristo version! A classic Monte Cristo is a sandwich made with ham and turkey (or sometimes just ham) and swiss or gruyère cheese that’s dipped in an egg batter (think French toast) and fried. It’s usually served with red currant jelly and/or dusted with powdered sugar. I’d rather walk around a party dusted with powdered sugar than look like I've been chewing on yesterday’s coffee grounds anyway. But seriously, the classic rolls are always such a hit I thought it would be fun to try something new! I couldn't find emmental cheese at the grocery store so I went with gruyère but I think you could substitute muenster too. I added an egg to the butter mixture to get the richness from the batter traditional Monte Cristos are dipped in and it was just the right amount of richness. When Husband saw me dusting them with powdered sugar he was very disturbed. He was almost whiny about it, convinced I was ruining something that otherwise looked fantastic. I explained it was a classic flavor combination but he still wasn't convinced and made me set aside a few without powdered sugar. Stubborn goat. I can’t wait to make these this year at all the holiday parties! I love having new things to share! Line a 13x9 baking pan with aluminum foil and spray very lightly with cooking spray. The aluminum foil is optional but it makes it very easy to remove the rolls from the pan once they’re cooked. Remove rolls from packaging without separating them and slice in half horizontally with a serrated knife (sort of making one giant rectangular hamburger bun). Repeat this process with the second package. Place both bottom portions of rolls side-by-side in the bottom of a 13x9 baking pan (these will fit perfectly in most metal 13x9 pans). You'll notice I didn't do such a hot job cutting mine because the top portion of the rolls is way thicker than the bottom. Whoops! Layer ham slices, turkey slices and then cheese evenly over rolls then place the top portion of the rolls on top of cheese. Whisk together melted butter, egg and dijon mustard until well combined and pour over tops of rolls, coating each one. Cover rolls with tented foil (don’t let the foil touch the tops of the rolls) and bake at 350 degrees for 20 minutes. Remove foil and continue baking for 10 more minutes. Remove from oven and let rest 15 minutes. Remove rolls from pan and slice into single servings. When ready to serve, dust with powdered sugar (not before as the powdered sugar will eventually dissolve into the moisture on the rolls). To be even more authentic, you could also consider serving with a little pot of red currant jelly in case anyone wanted to smear a little on their roll! I used King’s Hawaiian rolls. GENIUS!! I'm totally making these! Made these for super bowl night and my husband devoured these!! I couldn't stop eating them myself! Thanks so much for sharing this creation. Loved these! We also use them for a quick grab-n-go breakfast item! Great idea! I love this idea of turning Monte Cristos into sliders! I got really hungry looking at the photos. Pinning it! You just sort of make a "pan" from the foil by pinching the sides together. An easy way to do this is to flip the pan upside down (before you fill it with anything obviously) and form the foil around the outside of the pan. This ensures the foil tent will fit your pan perfectly. Love them Mandy! We made the original ham buns growing up and called them "Super Sandwiches" - we always have the mini-bun types at our Christmas Eve Feast of the 7 appetizers. Love your version!! Feast of the 7 Appetizers sounds fun. What else do you make as part of your feast? Your blog is AMAZING!!! I LOVE your sense of humor, kind of reminds me of ME! My husband even had a good laugh over this one and it takes some doing to make him laugh...keep the great recipes coming with the giant guffaws of laughter!! WOW!! What a FABULOUS idea! Thanks so much for sharing this lusciousness with us at Weekend Potluck. MMMMMMM! You. Are. Awesome. I am making these for our Halloween night get together... Perfect for grabbing and heading out the door for trick or treating! 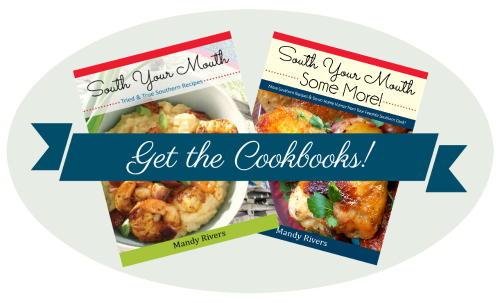 I just bought a few of your cookbooks on Amazon for Christmas gifts. Keep up the great, fun (and funny!) work. Raspberry jam is yummy with Monte Cristos too. Powdered sugar dusting?!! Sounds odd to me for a savory sandwich, but I'll give it a go to see. Fabooo an this is so easy. Id use home cooked organic turkey breast and ham if possible . Can these be frozen after cooked? Was thinking of making a bunch ahead for taking out of the freezer when munchiness strikes or emergency lunches needed! Ha ha!! I usually don't post to these blogs but I wanted to say I really got a kick out of your blog. The recipe looks yummy, too! So thanks for passing it along and thanks for the laugh!! A merry heart doeth good like a medicine!! Do you think sharp cheddar or Colby would work for the cheese? Though a less pronounced flavor,Colby should work well in these delicious tidbits ! I made these last weekend for my family (with regular dinner buns - I can't find the other type here) and I'm making them again this weekend. They were great the next day cold too. Another great recipe! Delicious! These were a hit at Girls Night In. Will try a mustard-free variety for Mister. Thanks for a great recipe! Looks great! How do these reheat? I haven't had a monte cristo in years. These tasted wonderful, were so easy, and the whole family loved them! Can't wait to make them for a potluck. Would these still be good if the powdered sugar is left off? Ok, so I want to make these for the luncheon at my sons fraternity next weekend. It's parents day so I do want to make an impression (the frat boys will eat anything so them I don't worry about ;) Do you just let them get to room temp for serving, or would it be better to keep them in one of those disposable "chafing dishes" (you know the tin foil pans w/ flame underneath)? I'm doing a "slider bar" and want to make these...they sound SO yummy!!!! A slider bar!!! Brilliant! You will WIN parents day! Haha! I think these are perfect served at room temperature! Don't sprinkle with powered sugar until you're ready to serve, though as it will disappear on you. Good luck! I can't wait to try these! I love the fact that they are baked, so don't have to be watched so much over like regular Monte Cristo's I spent three years in Europe and emmental cheese is the equivalent of swiss cheese. These are making my mouth water. I hope my husband reacts like yours. My husband doesn't normally like sweet rolls, though, so I may be the only one eating them---but then there is more for me! Had these at a Christmas party tonight and begged for the recipe. Definitely making it for Christmas Day brunch. Do you think these would work in a crockpot? I want to take them to work and have no way to bake them there. Would it work to put one layer of the sliders on the bottom of the crockpot and then foil and another layer--maybe parchment paper in between in stead--I don't want anyone to bite into foil. What a great idea - I'm definitely going to try these. My family loves Hawaiian rolls, so this sounds perfect! Really great with blackberry preserves. I halved the recipe since we're Empty Nesters. They're delicious cold, or reheat 2 sliders in microwave for 20-30 seconds. Im also a Cheesehead, so I added a layer of thin sliced Havarti White Cheddar. Ham, Havarti, Turkey swiss. NOM, nom, Nom, nom. 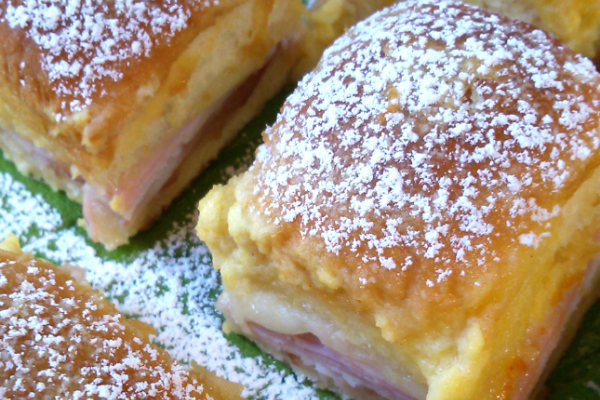 The classic ham & cheese Funeral Sandwiches, aka Awesomesauce Sandwiches to my four kids, are a staple in our multi-sport, working parents home. I can't wait to try them with the Monte Cristo twist! Thanks!!! Can you make the night before and keep in refrigerator. If so, would be pour the sauce on the night before too, or just do that step before they go in the oven?